Join us for 3 unforgettable days of networking, sessions & events. Please visit the registration desk to get your welcome package. An Agile Learning Strategy is key to addressing both the needs of your learners and delivering critical business results. In this session, we define the characteristics of an Agile Learning Strategy and giving hands-on practice with these concepts. We then follow with a guided tour of the best practices of the Axonify Instructional Design Methodology to determine how to support your Agile Learning Strategy with the best program type for your audience, the best content type and how to ensure all content starts off in the right place. This session is designed for Learning Managers, Content Developers and Program Administrators. Now you can use the power of big data to prove the business impact of learning. This optional half day hands-on workshop aimed at Axonify Administrators interested in measuring learning impact will show you how to set up and load data for Impact, as well as how to analyze and interpret the reports from Axonify Impact—and most importantly—how you can share meaningful results in your organization from Impact. Join us for our welcome reception. A chance to network and meet the Axonify team. Register for day 2 and join us for breakfast. CEO Carol Leaman kicks off the 2018 Community Conference with a look at the past year and where Axonify is headed in the following year. Shawn Kanungo is a strategist who operates at the intersection of creativity, business, and technology. He has been recognized nationally and globally for his work in the innovation space after 12 years of working at Deloitte. Shawn's mandate at the firm was to help corporate executives to better understand and plan for the opportunities and threats associated with disruptive innovation. Now, as General Partner of Queen & Rook Capital, Shawn is focused on applying exponential technologies and new business models to mature businesses. 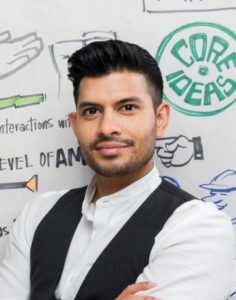 He is a practitioner who has worked hand-to-hand with hundreds of organizations on their journey to digital transformation, and he has adopted the concepts of behavioural economics, user-centered design, crowdsourcing, artificial intelligence, drones, and film to help create world class client experiences. Hear from some of Axonify’s long standing customers as they delve into the details of how they have transformed their business, and the evolution of their knowledge and performance strategy with Axonify in the mix. Join us for a tasty lunch. This Breakout Series is all about highlighting the creative ways our customers are innovating to make Axonify a success in their organization. Learn from Axonified organizations and their stories of unique launch and adoption strategies that drive interaction and excitement in the business. Hear how different Axonify customers are using their Subject Matter Experts in their business to drive their content strategy – and fuel new ways to create content that matters. Discover the ways in which customers are turning their frontline managers into their biggest champions of learning. Get ready to get your hands on some useful tips. This Hands-on Breakout Series will equip you with practical knowledge and tips that you can apply in your Axonify for immediate benefits! Learn from the playbook of other customers on the creative ways they are marketing Axonify in their organization, and leave with campaign ideas you can leverage in your business to promote Axonify. Uncover 4 key strategies to keeping your fresh content. Join us in this interactive session to learn proven strategies for keeping your content fresh. By creating a cadence, using data, taking a holistic approach to tell the whole story you can ensure your learners have engaging and up-to-date content. We’ll share tips and tricks as well as tools to help you apply this in your organization. The good news? Axonify tracks data about everything. The bad news? Axonify tracks data about everything – and knowing what you can do with it can be daunting. Learn what data is being tracked, how to access it and how to position it for optimal value internally in your organization. Listen to how these business leaders from organizations of different sizes and industries have got behind the Axonify solution, and how to leverage their strategies for buy in and support from your business partners in this panel session. Intrigued? A new product reveal to end a great day of Axonify sessions. A not-to-be-missed evening celebration to cap off the day. Register for day 3 and join us for breakfast. Carol Leaman kicks off day two. Explore the principles of a reimagined onboarding experience. We’ll show you how Axonify can get your employees into the operation faster and with greater capability. You’ll hear from Axonified organizations that are applying these principles today with measurable results. You’ll also gain insight into Axonify’s new Guided Learning feature and how you can build an onboarding experience that gets your employees moving in the right direction from Day 1! This Breakout Series talks about the things no company ever wants you to hear – where things didn’t work or go according to plan. But there is a happy ending with this story. The customers featured in this breakout session talk about where they stumbled and how they turned things around. Axonify is the world’s most powerful engine for building a knowledgeable and confident workforce – but people need to be using it to get the benefit! This session will provide some common challenges customers face in driving adoption, and strategies to overcome those challenges and drive engagement in your organization. Axonify will empower you to reach your field at a scale you’ve never experienced before – but that means you need the content to power that! This session will provide you with some of the challenges customers have faced in building content, but also identifying that there is a problem with the content they’ve built. Then, we’ll share some practical strategies to avoid those challenges in your business. Leaders are tasked with driving metrics in their business, and in the past, getting ‘completion’ of training materials was all that mattered – ‘Participation’ and ‘Knowledge’ are metrics they have never seen before, so why should they care? This session will address common challenges customers encounter when engaging with business leaders to drive and sustain engagement with Axonify, as well as some practical tools to overcome those challenges, and turn your Leaders into champions for your program! Do you every wonder: “How are other companies doing who have Axonify that use it like we do?” Getting the viewpoints of your peers in the same industry is a great way to validate how you are rolling out learning, and also provides additional channels and proof points of what could work in your own organization. This extended breakout session series will have you exchanging ideas and making connections with peers in the same industry you are in over lunch! Did you know Axonify has over 16 unique features that can help you improve knowledge, impact behavior, and achieve your business goals? This lively panel will introduce you to customers sharing examples of the unique ways they are using Axonify features successfully, and how these features have helped transform how learners engage with Axonify. A recap of the sessions and key takeaways, so you head back armed with real-life, applicable ideas for your own organization’s success. You’re the best of the best – and we want you to know it. This much anticipated and closing session of the Community Conference celebrates all of your successes with our awards session.